On Sunday last week, we reviewed Amin’s chess game with the colonial master Britain, in which he caused a delegation led by his mentor and former commander of the King’s African Rifles in Uganda Lt-Gen Sir Chandos Blair kneel before him. 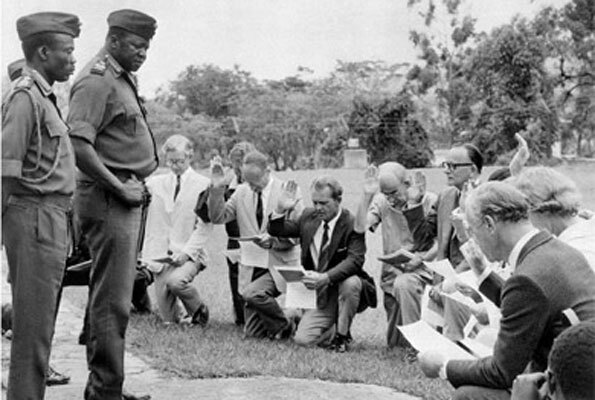 The question of the British delegation kneeling is not refuted, however, the Britons later claimed they did not kneel, but Amin played tricks on them to ‘kneel’. Amin gifts Blair with a bow and arrow. Courtesy Photo. 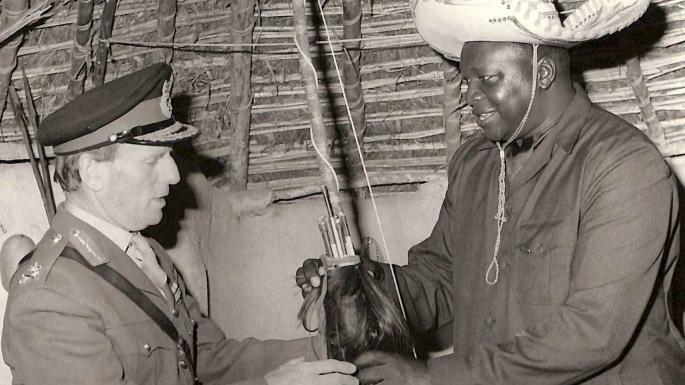 Amin was sergeant when Blair was commander of the Kings African Riffles in Uganda and because of his (Amin’s) ‘hard work and toughness on the battlefield’, Blair promoted him to lieutenant and shortly after (1964 according top records) returned to UK. 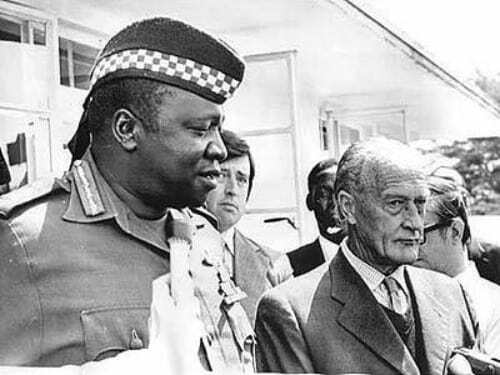 The two would later in 1975 meet when the tables had turned; Amin was the President of the Republic of Uganda and Blair was only a negotiator on behalf of Britain to grant mercy to Denis Hills. Blair’s assignment was to plead with his former adjutant to spare the life of Hills. Carrying a letter of indulgence written and signed by Queen Elizabeth, Blair landed at Entebbe on July 20, clad in full combat uniform. With Blair, was also another of Amin’s commanders; Major Iain Grahame. Britain was so hopeful that Amin seeing his army commanders would be persuaded by the army code, to listen to them quickly. Quickly they went on with their business, placing an appointment to meet Hills in the presence of Amin the next morning (July 21). During the meeting, Blair and Grahame lavished Amin with praised to reverse his psychology. They remarked that the President was the best swimmer and boxer they had ever seen. They also rebuked Hills and chided him before commanding him to jot an apology note to Amin for calling him names in his book. Alas, Amin did not buy it, he let them finish, laughed so hard then said No, he demanded they bring someone else to negotiate. Blair then opened another tactic book in which he told Amin that execution of Hills would cause trouble for Uganda as British troops would invade using the Kenya entrance. The meeting with Blair took place at Amin’s country home in West Nile. A very happy Amin gave Blair gifts that included; a Spear, bow and arrow before they sat to talk. It was during the talk that the two men began exchanging bitterly. Blair would then stand up, with calm he said: “Disappointed,” then he saluted Amin and chose to leave. With Blair and entourage leaving, Amin also ran to his delegation and commanded them to call “Libya to send war planes here before British army attacks.” He also ordered communications from Uganda to outside world be blanketed. Although it is true that Blair and group took the Queen’s letter to Amin on their knees. They would later claim it was not deliberate. Interviewed later 2011 by the Telegraph, Blair claimed the group only had to stoop so low in order to access the entrance to the hut where they would meet Amin. Accordingly, Amin had chosen a strategic location and made sure the hut entrance would not be accessible by someone unless they went on their knees. And right there, he achieved his objective- they knelt and dragged their bodies on their knees until they were in proximity with Amin. Meanwhile all this time, Radio Uganda and Uganda Television captured this and reported prominently (live broadcast) to the amusement of Ugandans and to the anger of Britain. Amin was enjoying it most, days later he forced 12 Britons to swear an oath of allegiance in exchange for citizenship. They swore oath while kneeling in front of Amin and this was on live broadcast as well. Blair retired a year later, and died in 2011, aged 91.